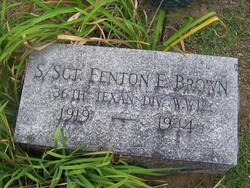 Fenton Elmer Brown and his twin brother Forbes were born in Fulton County on this date in 1919. Tragedy entered their lives early, when their mom Ida died just a year following their birth, a victim of the flu. The twins’ father, Charles was killed by a heart attack when the boys were just sixteen, forcing the orphaned siblings to come to Amsterdam, where they moved in with an aunt and uncle and finished high school, graduating from Wilbur Lynch in 1937.